LONDON — Fair warning: this is one of those things that will make your brain hurt. BBC trainer Marc Settle recently stumbled across a headache-inducing optical illusion while packing away his son's wooden train track. "I was tidying up my son's train track... again, as I do every evening," Settle told Mashable by email. "But this time, I stacked one piece on another (rather than just flinging them all in a box) and lined them up exactly. I then (for some reason, no idea why) took the top one off again and placed it on the table below the other one and *blam* — then I saw it. "I did it again and again, for my own curiosity; but each time the piece was placed on top of the other one, it was the same size *precisely* but bigger when it was placed underneath the other one... which fried my brain." So what the hell is actually going on with those train tracks? Well, it looks like the answer lies in an illusion discovered by a psychologist in the 19th century.Basically, as the Jastrow Illusion explains, the whole thing has to do with perspective. 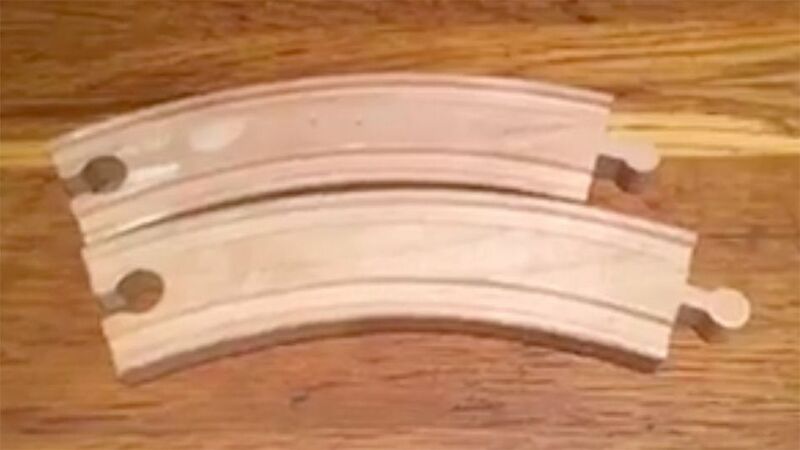 The two pieces of track are indeed the same size, but because of the shape (the tracks curve, so the top arch of each segment is longer than the bottom arch) and the angle of their placement the top segment of track appears bigger when it's lined up in a certain way with the bottom segment.